Smitaki: June 25 – Help: a barracuda! June 25 – Help: a barracuda! But the people who come to the island often know that this past May and April were exceptions. Very bad weather can be encountered anywhere, even on the sunny island of Lesvos. Although a writer on My Greece Travel blog.com thinks differently: he (or she) made a list of his bad-weather-experiences in May and June during his holidays on several Greek islands. He finished with the advice that travellers to Greece in that period should pack some firm shoes with anti-slip soles in their suitcases so they can gallivant carefree over all the wet tiles and marble floors. Lesvos was actually relatively lucky during those dramatic bad weather days; on the Greek mainland it was so disastrous that many a harvest was washed away. You would think that all that rain is good for the plants. It is so good that all those weeds that were so painstakingly removed in early spring, got new life. Now that the heat finally reigns over the island, it's time to weed again. My prunes certainly didn't like all the regular water from heaven and were bursting open in protest. Even the strawberries, who are known for their unending thirst, got confused and no longer knew when to ripen: for two months now, every few days I harvest a poor little bowl full of them, while in other years the harvest took just two weeks. I am wondering from where shops and restaurants get their tomatoes, because for sure they do not come from the land around here. Tomatoes don't like mud and the fields have been muddy for weeks on end. Only the green beans, cucumbers and courgettes enjoy a soggy earth. They are the main harvest right now. When you eat in a small tavern, the choice on the menu may be meagre, because they serve only vegetables from their own garden. Last week I was in Gavathas with my family and after a swim I really longed for ouzo and fish. When we were passing through the village, I saw a small psarotaverna, a fish restaurant, which I had never noticed before: O Rofos, named after very tasty fish (dusky grouper). In the open door stood an old Greek lady and I was not sure if she was waiting for customers or if she was on the point of scrubbing her doorstep. We decided to give it a try and I asked if the restaurant was open. Of course it was and we took a seat on the balcony that has an astonishing view over the village and the Gavathas Bay. We were given paper tablecloths that kept on waving around our ears because of the wind. Lady ‘O Rofos’ was confused what to do first - take the order for the drinks, make a list of the food she could present or search for the table cloth clamps that seemed to have gone with the wind. She just kept on pacing back and forth. She found a solution by making a telephone call. While we removed the tablecloths and got beer and ouzo (there was no retsina or other wine) we saw a speed demon racing over the road towards the village. It was the reinforcement: the son of lady ‘O Rofos’. He proudly showed us two large dishes piled with fish, all caught that morning from the bay. And he even pointed out where exactly in the water he had caught them. We had a choice between gavros (a kind of anchovy), kefalos (mullet) and there was a bigger fish with a long thin nose that I had never seen or eaten before: its name was loutsos according to the fishing son. “A pike!” everybody called out seeing the fish. But how can a pike, a freshwater fish, have come out of the sea? We were hungry and settled, thinking it was a fish with a local name and we rounded-up our order with whatever else there was on offer: French fries, a cucumber salad, the one remaining dish of green beans and some feta. I am afraid we ate the midday lunch of the family. 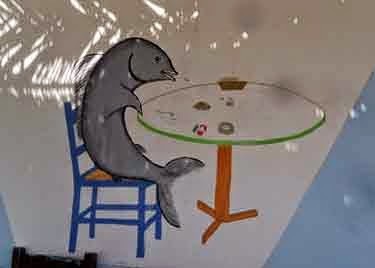 Just below the great wall painting of a rofos smoking a cigarette and downing an ouzo, we dined as kings. The loutsos – the middle part cut in slices and fried – was excellent, the green beans were gone within a minute and the salty feta was homemade and great. Such simple but divine, fresh meals are now only to be found in the small taverns where an old Greek lady serves and her son does the fishing. And the loutsos? After hours and having no result in finding a loutsos on the internet, I decided to take a look at a pike: the fish did look exactly like the fish we ate and its latin name is Esox lucius (lucius could be pronounced as loutsos). Could this be the one and could it have been raining so much on Lesvos that in the bay of Gavathas there is now brackish water, suitable for pikes to live in? Of course not! Eventually a friend suggested it might be a barracuda (Sphyraena), also a fish with a long and thin nose, called by the Greeks loetsos. Just like the pike it is a predator, but this one with a bad reputation. Maybe that is why I couldn't find it on different lists of Greek fish. According to Wikipedia most stories about barracudas attacking people are urban myths. But a barracuda on your plate sounds far more interesting than eating a pike and this predator definitely comes on my personal list of delicacies.